A blue star with white eyes. The Coin Rush Star is an item that first debuted in Super Mario Run's Toad Rally mode. They are blue stars with silver eyes. By collecting coins and performing certain moves, players can fill up a gauge in the top center of the screen. 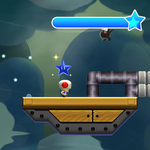 Once the gauge is filled up, the Coin Rush Star will appear from the meter and hover over the player for a few seconds, before dropping onto them and activating a Coin Rush. However, this does not make the affected character invincible. This page was last edited on March 28, 2019, at 16:39.